Want to bring natural light and style to your kitchen? You might want to consider custom windows. Windows are truly more than just openings in walls. They help you seize the outdoors and are a simple way to add flair and elegance to your kitchen’s look. So, if you're kitchen is currently lacking windows, it's time to change that. It’s important to note that windows play a role that’s equal parts practical and appealing. Since windows create the illusion of a bigger space, they typically add value, style and function to your kitchen renovation. With so many options to choose from, picking the perfect windows can be an overwhelming and lengthy task. Don't worry, we did the research for you. 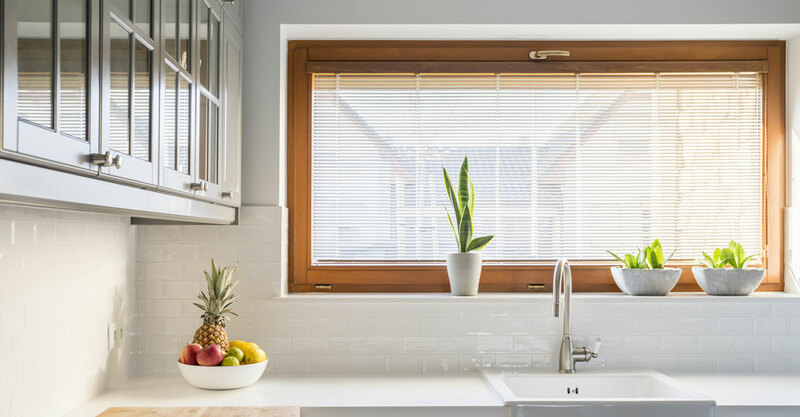 Now, let’s take a look at some window styles and options that will help you choose the right kitchen windows for your home. First things first: we suggest reviewing your kitchen layout to figure out where you can practically add windows. You might even be able to expand your existing windows, if desired. It’s a matter of personal preference and allotted space when it really comes down to making a decision, though. It’s also just as important to decide on a specific material. Windows are typically available in wood, vinyl, aluminum and steel. At this point you’ll want to select a material that matches or enhances the rest of your design. Kitchen’s with large windows are extremely impressive and great for entertaining. They also make cooking more pleasant as you’ll get to admire the outdoors as you move about the room. 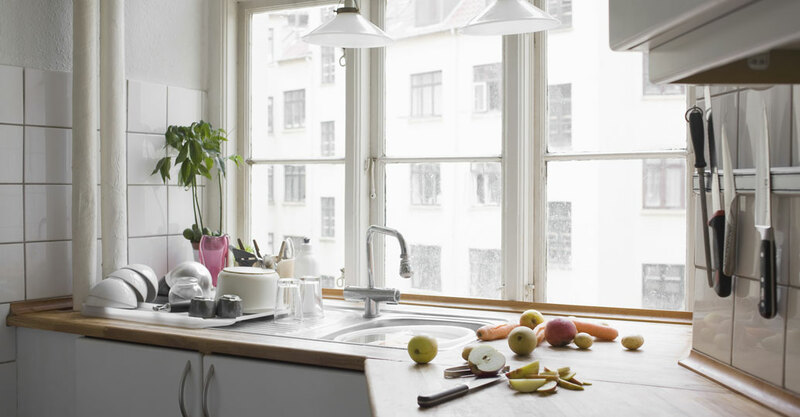 The most popular large kitchen windows include casements, bows and bays. Casement windows open outwards and offer an unobstructed view. Additionally, you’re able to control the air flow in your kitchen and ensure your home won’t overheat while cooking up a storm. Bow and Bay windows usually consist of one large central window framed by two or more smaller angled windows. They do require significant space, but provide an unmatched view of the outdoors. Bow and bay windows are also great options because they allow for additional storage/decorative space. You can place your vases and plants on the ledge of these windows, or even turn them into benches for extra seating in some cases. If you only have a small section of wall facing the outside of your home, you’ll have to limit the size of your kitchen windows. The most popular smaller options include different variations of sliding windows. Typical sliding windows open horizontally along a track in the frame, and the tight seal helps keep extreme temperatures out for a more comfortable interior. 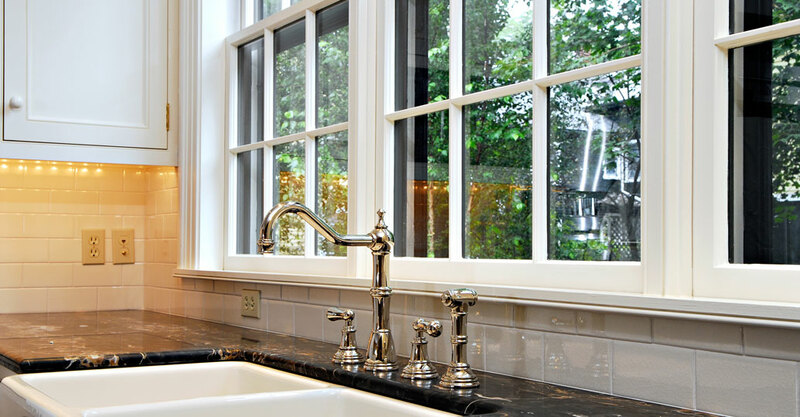 If you’re looking to place windows above your kitchen sink, sliding windows are your best choice. Not only do they open with ease - they give you excellent control of  air circulation since both sides can be opened at the same time. They are commonly used on walls where the width is greater than the height. There are times when it’s just easier to open and close a sliding window rather than a double hung. If you’re placing a window above a counter, sink or other hard to reach spot - sliders will definitely be the easiest and most convenient option. Double hung windows work well in most rooms, and also allow for greater ventilation. They are often used on walls where the height is greater than the width. Double hung windows are known to be the easiest-to-clean option due to their tilt-in sashes. If your space is exceptionally narrow, single hung windows are an even better alternative. They are extremely versatile and are generally the most affordable option. This option is also most suitable for installing window air conditioners. Kitchens are one of the few areas in your house where you actually need to take the functionality of your windows into consideration above their visual appearance. As you see now, each window style has unique benefits. So, when remodeling your next kitchen, make sure you explore all these options!